Eleanor Trewynn is a widow of some years living in Port Mabyn, a small fishing village in Cornwall, England. In her younger days, she traveled the exotic parts of the world with her husband. These days, she's retired and founded the local charity shop. Her niece, Megan Pencarrow, transferred nearby, and was recently promoted to the rank of Detective Sargent. Perhaps the only downside is that she is now working for a DI who doesn't approve of women on the police force and who really doesn't much approve of Megan's aunt Eleanor, as she is something of a thorn in his rather substantial side. All of these factors collide when, the day after collecting donations, Eleanor and the vicar's wife find the dead body of a longhaired, scruffy-looking youth hidden in the stockroom of the charity shop. Then they discover that some donated jewelry thought to be fake is actually very real, very expensive, and the haul from a violent robbery in London. Making matters more complex, the corpse found in the storeroom is apparently not one of the robbers. 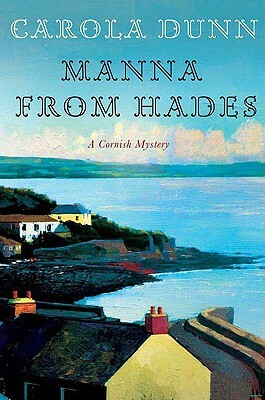 Carola Dunn's "Manna from Hades "is a confounding Cornish case of daring theft, doublecross, and a wily older woman confronted by a case of murder most foul. Born and raised in England, C AROL A DUNN is the author of nearly fifty novels, including the long-running Daisy Dalrymple mystery series.